Most people know about the famous Greek “Zorba” and the Greek lifestyle. Well, this time our team created a 100% Greek team building experience in Athens for a top utility company from France. 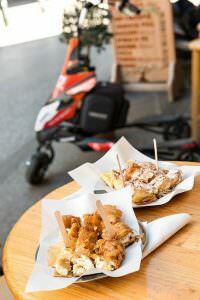 All participants were excited as they explored the city of Athens on electric Trikke vehicles, carved their way through the the picturesque alleys of Plaka to Monastiraki where a “surprise” food sampling with Greek delicacies awaited them. After indulging into savory bites, the group continued riding the electric Trikkes towards Kallimarmaro stadium, where two teams competed in an exciting racing and agility competition. After many pictures, on their way back to Scooterise, all participants had the chance to feel more Greek by dancing “Syrtaki” accompanied by music and a professional dance instructor. Dear friends thank you for having a wonderful time in Greece !